artplusdesign > Public Art > I Did It! iDIDIT! 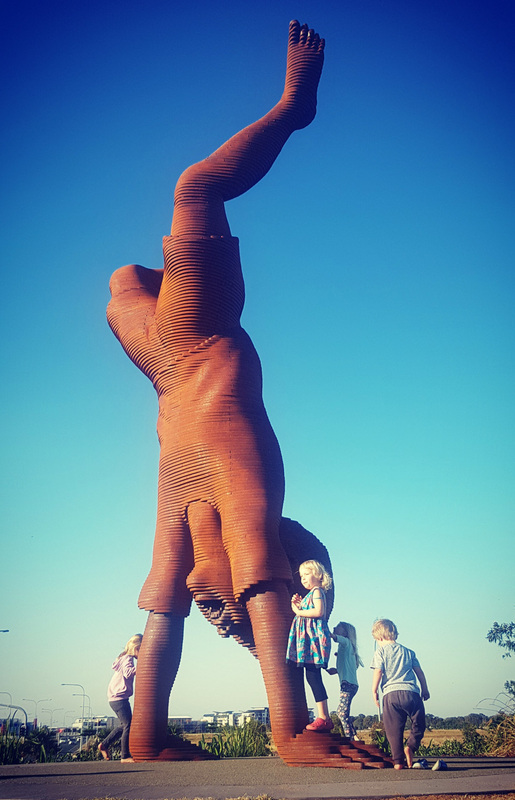 is a monumental sculpture that captures the joy of a child successfully performing a cartwheel. iDIDIT! is a bold statement that elevates the fundamental importance of play in human development and promotes learning, health and family focus. iDIDIT! is a prominent day/night statement viewable from 360 degrees and designed to be interesting for car passengers, pedestrians, hospital patients and visitors and park goers. iDIDIT! is created from 244 layers of 25mm plate weathering steel. It is 25 tonnes and serves as a focal point and welcome to the Sunshine Coast Private Teaching Hospital. * Stuart Brown, MD. In Brown, S., & C. Vaughan. 2009. “Play: How It Shapes the Brain, Opens the Imagination, and Invigorates the Soul”. p.166, New York: Penguin.